In a stable country, we would not be talking about this feud of the blowhards. This is not a stable country. In a sane world, I wouldn’t be writing about Donald Trump vs. LaVar Ball. In a sane world, this story of two TV reality-show blowhards bloviating at each other to build their respective brands would be a mildly amusing distraction from the troubles of modern life. Yet we have to write about it because one of these natterjacks is the damn president of the United States. 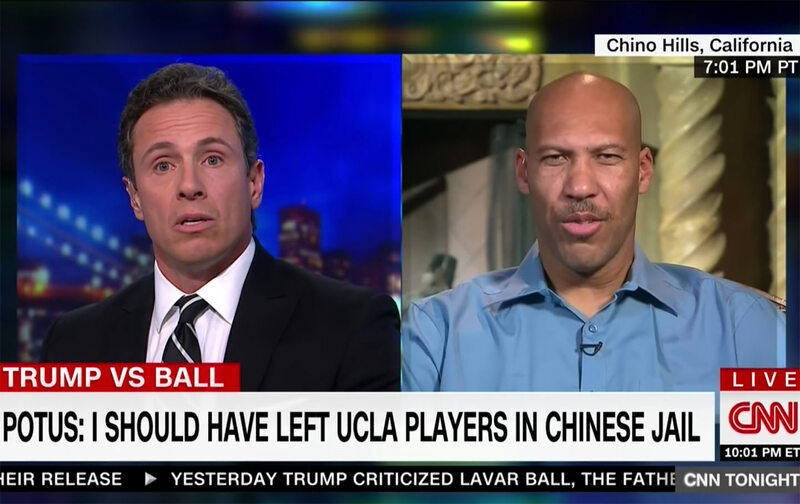 It’s a problem that the president is tweeting that he should have let LaVar Ball’s teenage son, UCLA basketball player LiAngelo, rot in a Chinese prison because his father wasn’t “grateful” enough to the president. It’s a problem that the president is lying to the American people. (LiAngelo Ball and his two teammates were already receiving preferential treatment, and the process of getting them out was underway before Trump made any kind of intervention.) It’s a problem that Donald Trump has a penchant for attacking outspoken black athletes and high-profile black people in the sports world, to the thrill of his base. In other words, his continual, knee-jerk racism is a problem. It’s a problem that we are talking about this—that it is the lead story on just about every news network—at a time when the Republican Congress is about to pass a tax law that will rob working- and middle-class people to pay for corporate tax breaks, a tax law that is being done openly to appease donors and stands to save this president and his family of grifters over one billion dollars. It’s a problem that we are talking about this when net neutrality is about to be gutted, when there is a needed reexamination of the president’s sexually predatory behavior, and when the president refuses to comment on the GOP child molester running for a Senate seat in Alabama. It’s a problem that we are in a media climate where any publication or network—including me here at The Nation—would have gladly taken that interview with LaVar Ball on Tuesday night (although CNN is milking this to a degree that is stomach churning). It’s a problem that LaVar Ball who said on CNN, “Why are we talking about this with all these political matters going on in the world?” actually sounds more presidential than the president. Make no mistake: The big winner here is LaVar Ball. Not only does this P.T. Barnum–esque basketball dad become the number-one trending topic on earth, but he gets reintroduced to a new audience suddenly enthralled with his undeniable charisma and verbosity. His Big Baller Brand has gotten an untold number of new eyeballs. Donald Trump is also a winner here because we are past the point of logic with the racist part of his base. They would correctly be howling at the moon if President Obama demanded thanks for “freeing” an American in a Chinese prison. But, as he has shown, Trump—even as his own popularity is at historic lows—can cling to that base by using rank racism and being an autocratic bully. We are the great losers in this battle because we live in a country where this orange baby is president, where the lesson gets learned that the power of one’s brand is the ultimate goal worth pursuing, and our pockets get picked while we watch the spectacle. Rome is burning. The GOP is lighting the match. And we are all in a mad rush to be the one who gets to play the loudest violin.